It has taken me an eon it seems to finally get to what is rapidly becoming the “legendary” permanent base in Barry, South Wales of the dynamic duo (already the undisputed queens of the South Wales pop up scene) behind the phenomena that is Hangfire. This was due to a mixture of illness (had to cancel my original booking in the early days of them opening due to removal of a jumbo gall stone – the dinosaurs came a cropper due to only a slightly bigger rock – with complications in the form of a torn liver), laziness (getting to Barry from my Llandaff base whilst still being able to have a drink was perceived by me as somewhat of an arduous multi mode of public transport feat – it transpires it wasn’t) and the trickiness of getting a table (it is insanely popular especially at weekends). 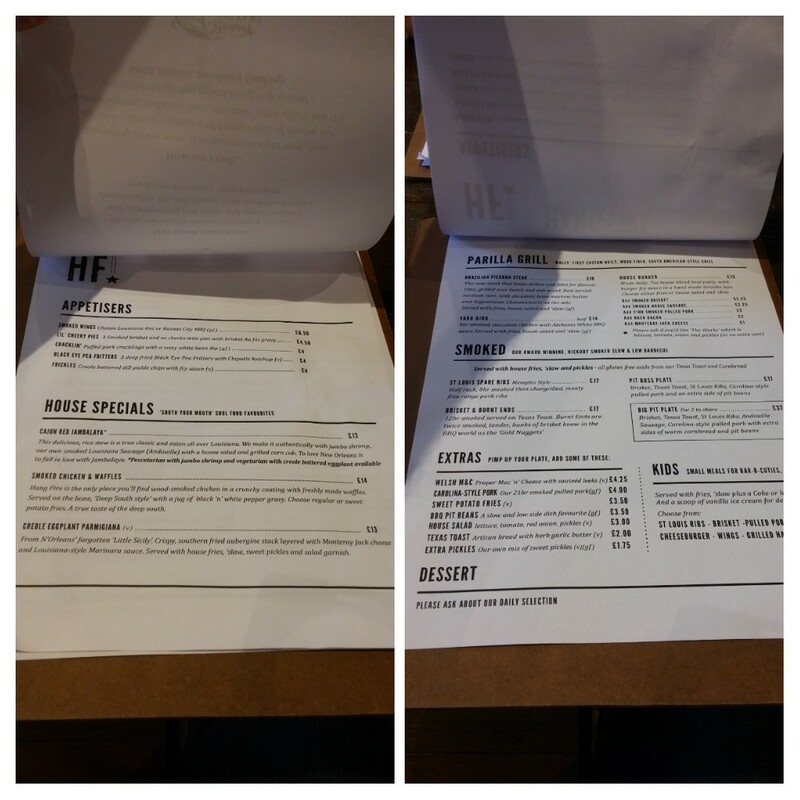 A week off from work “Staycation” provided the flexibility to allow for a mid week supper at Hangfire. We booked in (sometime in advance) and hopped on a bus (took a train back) to get us to Barry. Amazingly we got there, leisurely stuffed our faces, and got back door to door in under 3 hours 40 mins. UK Seaside towns have in the past suffered serious decline, but recently there has been somewhat of a renaissance. 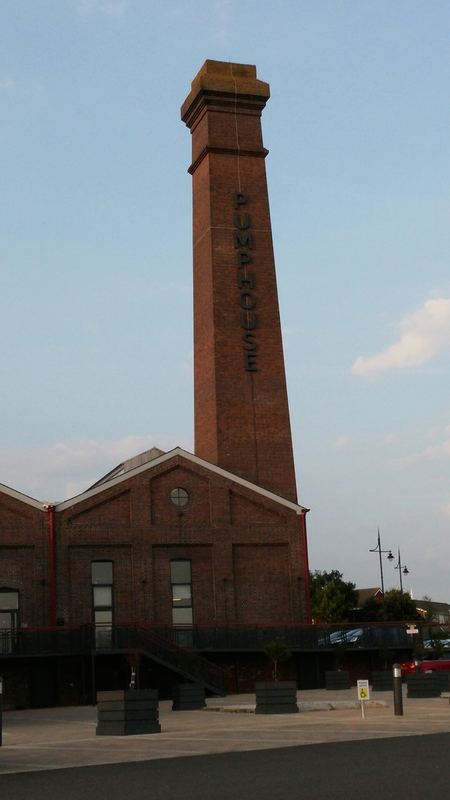 St. Ives and Margate have their temples to art in the form of the Tate and the Turner Contemporary respectively and Barry now has its temple to Southern gastronomy in the form of the Hangfire Southern Kitchen, within the rather splendid Pumphouse building. It is lovely on the outside and on the inside, with a very relaxed feel to the place. On our visit, it was buzzing at 18.30 on a Thursday with a mix of young and old clientele. It seems to cater for all ages which is nice to see, with a playlist that is nicely judged in both taste and volume. Personally can’t be doing with places that boom out “trendy” muzak as I am of the view that aural sensory overload impacts negatively on your ability to taste stuff. Probably why Five Guys pumps up the volume! We started off the feast (for that is what it was) with a very pleasing dish of “cracklin” (£4). 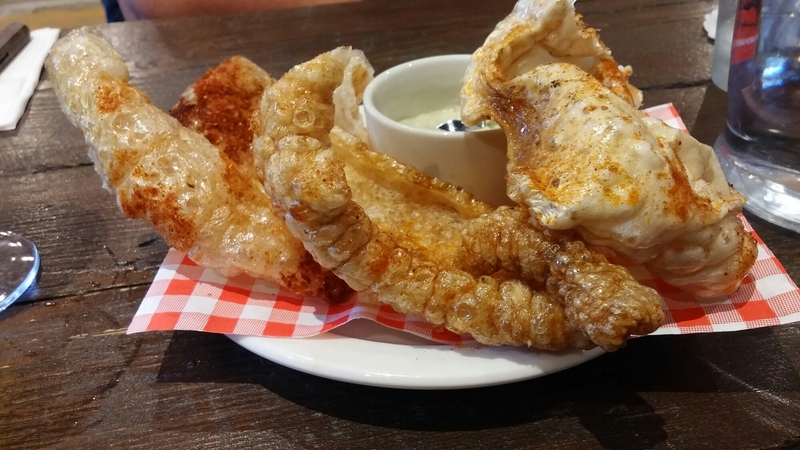 Ultra crispy pork rinds, sprinkled with a spicy rub, hit all the flavour receptors and was nicely complimented by a punchy white bean dip which had a lovely garlic hit (finger was deployed to ensure not the slightest amount remained in the ramekins it was served in). One of the rinds (far right one) could have done with a second or two more fryer time (it was a touch papery), but all in all this was a very good start to proceedings. On to the mains, both Mrs. SF and I were (having sampled Hangfire’s BBQ when they were in residence at the Landsdowne pub in Canton) only ever going to go for something from the smoked section. 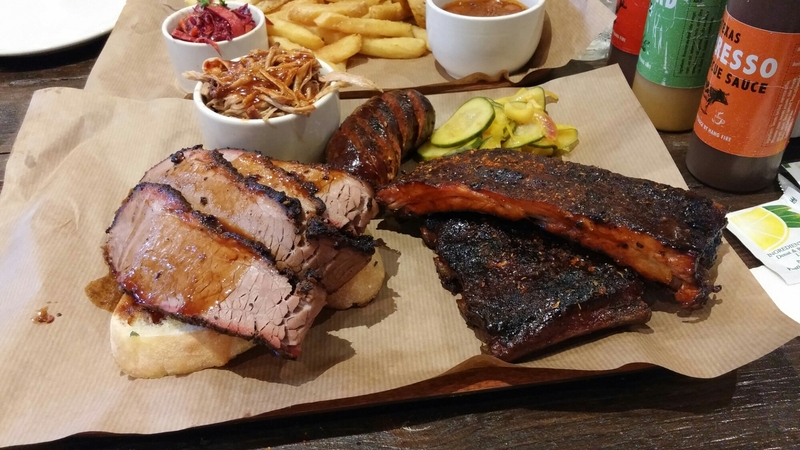 The only question was ribs or brisket, with Mrs. SF and I loving both. The solution to the dilemma of what to order was the “Big Pit” plate (£37 for 2). Gosh where to start with this plentiful platter. Four thick slices of top quality brisket, with a lovely kiss of smoke as denoted by the beautiful smoke ring was the obvious place to start. The richness of the brisket was nicely balanced by some super pickles. Lovely, sharp, acidity and a great crunch. Brisket is an unforgiving beast on the smoker (get it wrong and it can be tough as old boots and very dry) and it takes an awful lot of skill to get it as succulent, melt in the mouth, and full of flavour as Hangfire’s. The luscious brisket sat on a slice of Texas Toast (garlic bread to you and me). Nice enough, but can’t say would have missed it if it hadn’t been there. Next up was a chunky andouille sausage, which was wonderfully meaty with a nice warmth from chilli and spice. Perfect with Hangfire’s fantastic South Carolina mustard sauce (the star of an ace trio of sauces on the table – the others were Texas espresso and Kansas City BBQ numbers). The pulled pork perhaps played second fiddle to the other meats, but had a pleasant piggy flavour and was meltingly tender. It was laced with BBQ sauce (the Kansas City one I think) which worked nicely in cutting through the richness of the meat. This brings me to what I thought was the pièce de la résistance in the form of absolutely killer ribs. A great bark, with a gorgeous smokiness and layer upon layer of spicy flavour, capped wonderfully succulent rib meat that came off the bone with the merest tease. I like to think I cook a pretty mean rack of ribs in my smoker at home, but my paltry efforts were put into pitiful context by these beauties. If there are better ribs out there I need to know where. 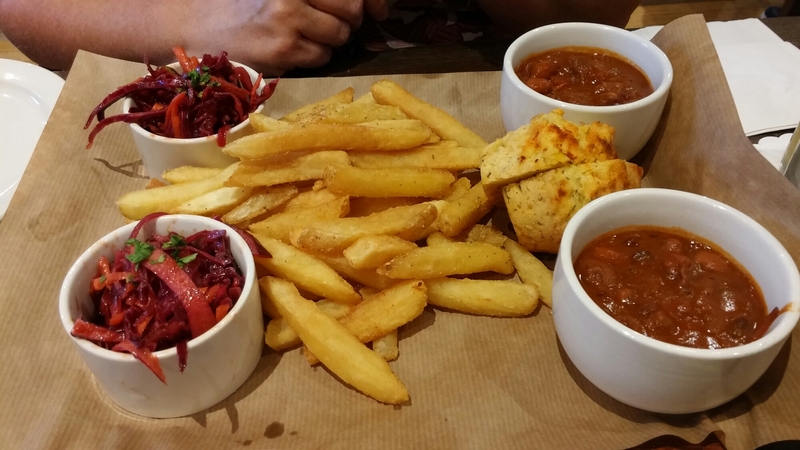 On top of the wonderous smoked meats, the Big Pit Plate comes with numerous sides in the form of some fantastic BBQ pit beans (I absolutely loved these – absolutely jam packed with flavour), a really good vinegary slaw and what was billed as corn bread. 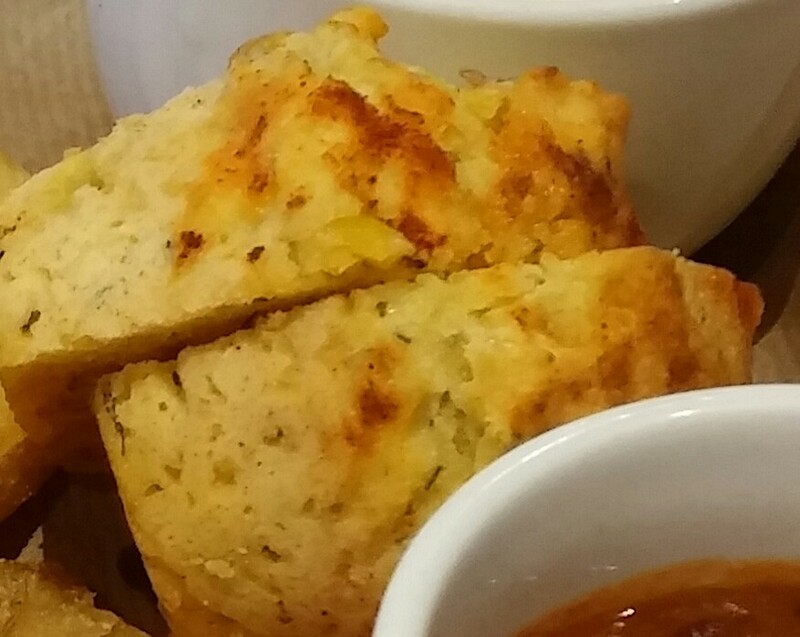 I am not an aficionado when it comes to cornbread, but this seemed to me to be more akin to a biscuit (savoury scone to us Brits) in texture and on its own it was a touch on the dry side. This was remedied by spooning over it the luscious BBQ pit beans. Last of the sides were a generous portion of seasoned fries. Crisp on the outside (with a nice seasoned coating) and fluffy on the inside, these were good chips. Perfect for dipping in the South Carolina BBQ sauce. 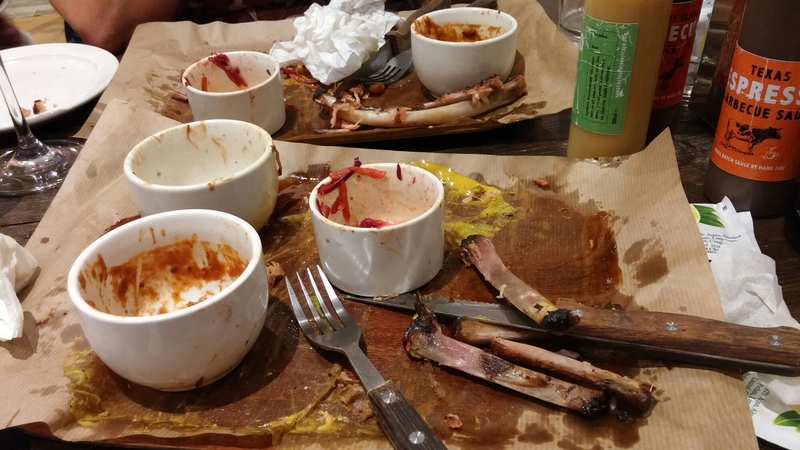 Despite the size of the Big Pit Plate barely a scrap of food was left when we finished and we felt wonderfully sated rather than uncomfortably full. This really was a cracking ensemble of food. We passed on dessert due to a combination of having a train to catch back and having had just the right amount to eat without it. On the booze front they have a selection that pretty much covers all bases, with beers, ciders, wines and gins (as well as soft drinks and I believe cocktails- didn’t see them on menu and assume I missed that page ). The real focus is, however, on craft beers and of these they have (to my rather uneducated mind beer wise) an excellent looking selection. 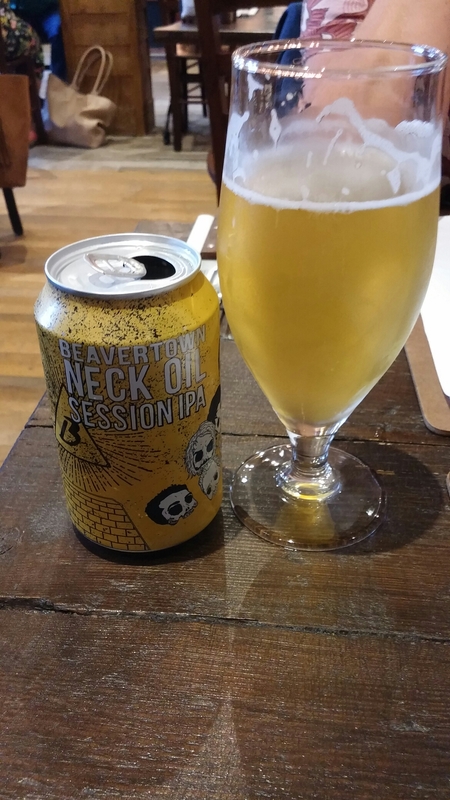 I went for an easy drinking number in the form of a Beavertown Neck Oil Session IPA (£4). Nice citus notes (grapefruit) to this beer, which was dangerously gluggable. 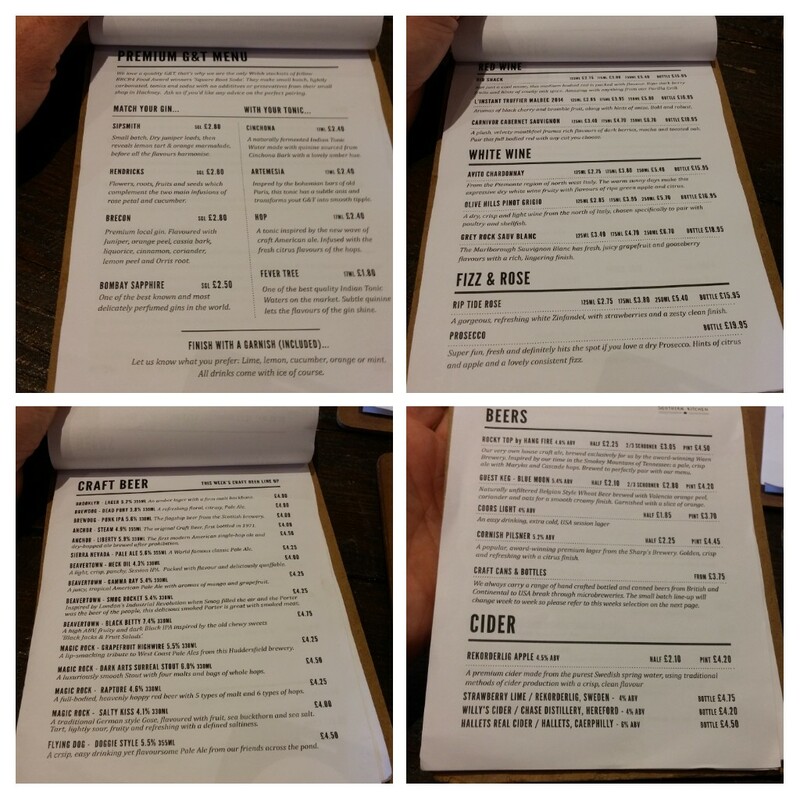 Mrs SF went for the Cornish pilsner (£2.25 for a half) which she said was very nice. Whilst I know beer is the traditional accompaniment to low and slow BBQ, in my ever older age I tend to struggle with too much volume beer wise and personally I quite like wine with it. It is tricky to match mind. 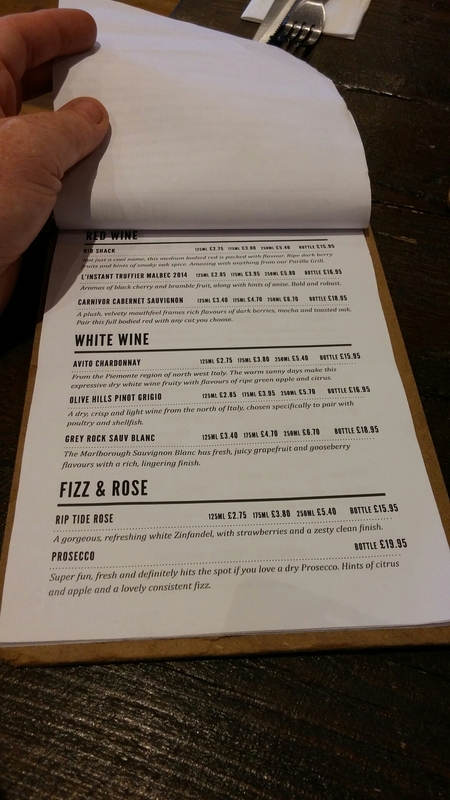 The list is quite short, but very fairly priced with nothing more than £19.95 (inc the fizz on offer). This was a pleasant enough quaffing wine and the surprisingly low alcohol worked well with the spicer elements of the platter. It did lack a bit of oomph and was a little overwhelmed by the myriad of flavours on display. It was, as a result, tricky to discern much from the wine. Nice to see them not being greedy on the mark up front (it retails at around the £8-£9 mark). 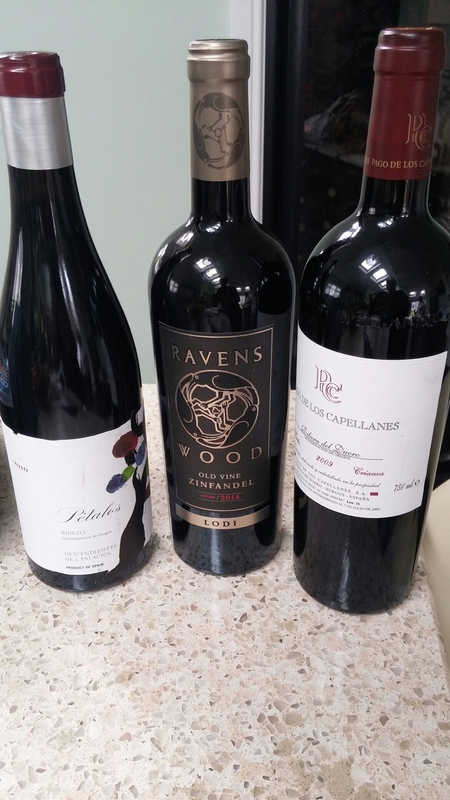 If I was picking reds for American BBQ, I would probably go for a Zindanfel (along with perhaps Aussie shiraz, the generally accepted match), but wines based on the tempranillo grape also work very well particularly those from Ribero del Duero (one on the right in the picture below). A left field option (the bottle on the left in the picture below) would be a wine from Bierzo (from North West Spain and made using the mencia grape). These wines are big and juicy and quite crunchy in nature. I personally think they are a good match for the robust flavours of American BBQ. For the chicken and waffle I would go for a fizz (so the prosecco on the list) and for the jambalaya I would have preferred a chenin blanc or riesling (both with a touch of sweetness) over what is on the list (would probably settle on the pinot grigio from the list if had to choose). Shame some of these types of wine (which would also pair well – on the red front – with the parilla stuff on the menu) are not on the wine list, but I get that beer is (and probably should be) the clear focus here drinks wise. 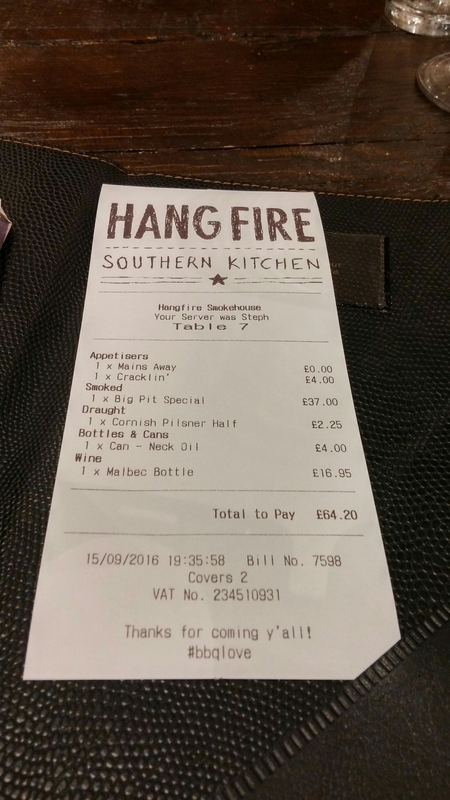 As you can probably tell I loved Hangfire Southern Kitchen. 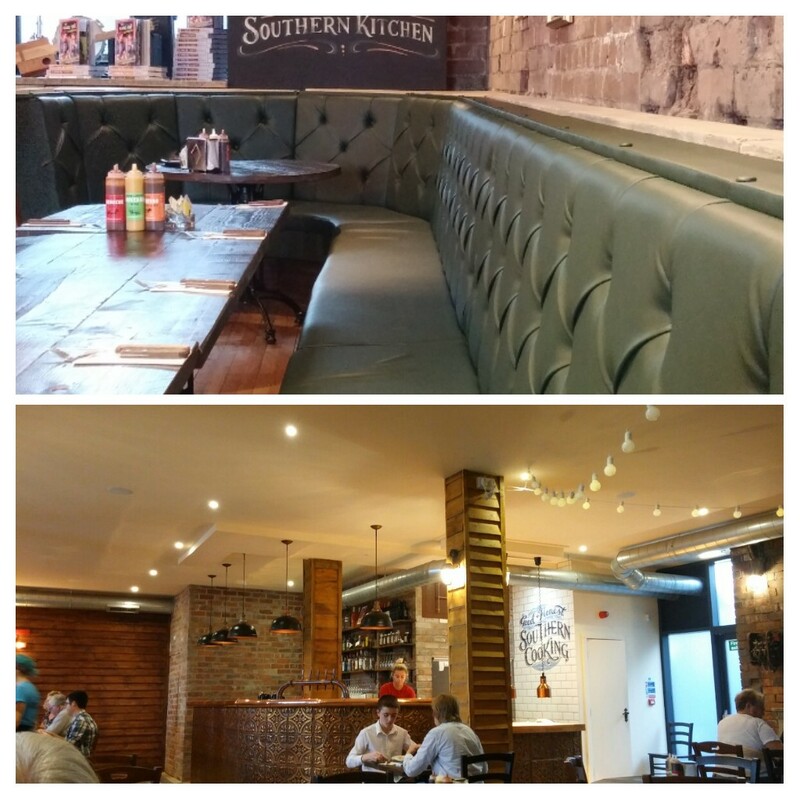 Fantastic food and a very pleasant, relaxed atmosphere. All in all just grand. On the price front we paid just over £64 (sans a well deserved tip – service was very good) which I thought excellent value based on the quality and quantity of what we got. 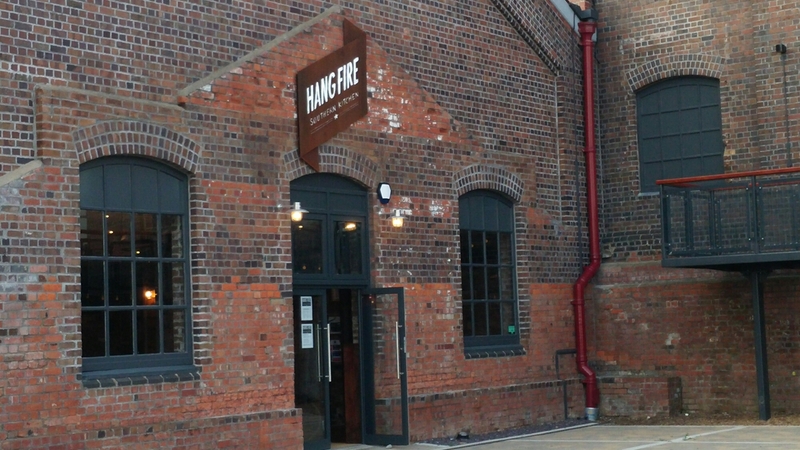 As the post title indicates Hangfire Southern Kitchen really is totally boss and whilst Barry is affectionately known as Barrybados in these parts, perhaps with Hangfire’s impeccable Southern credentials it should be Barry Bayou. Will I go back? Hell yes – try and stop me! Got to have me some more of them ribs. 10 min walk max. from Barry Station and buses (93, 95 and 96) from Cardiff also stop within easy walking distance. Weds – Sat: 17.00 to 21.00 (open until 23.00). 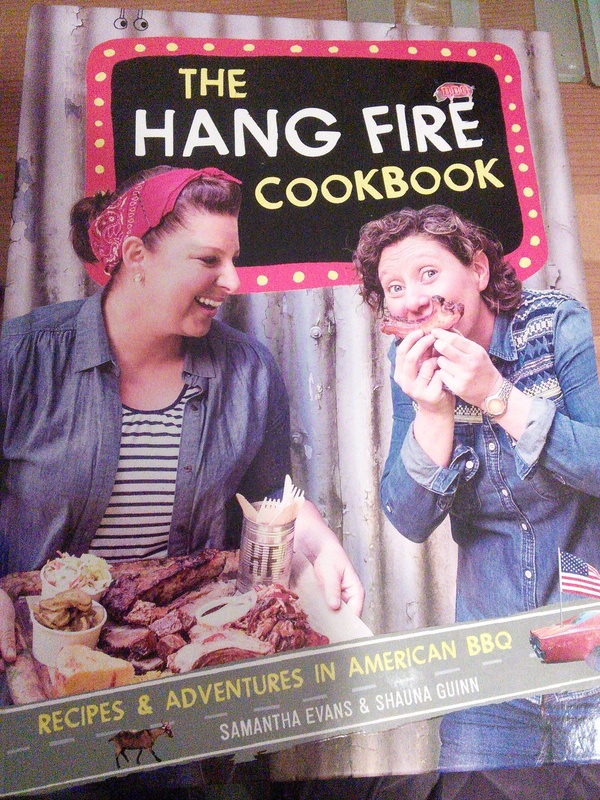 P.S: Get their book – I have a fair few BBQ books and this is one of the best. 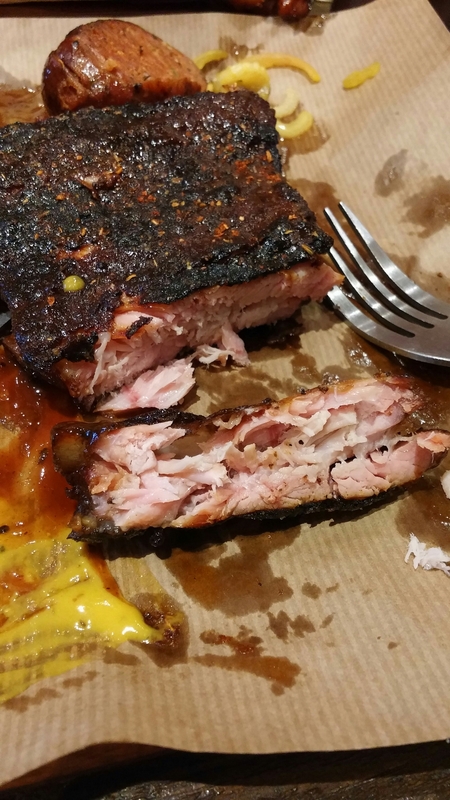 Everything I have tried from it has come out really well (ribs from it were awesome, but still not a patch on theirs – I suspect that is down to my incompetence). 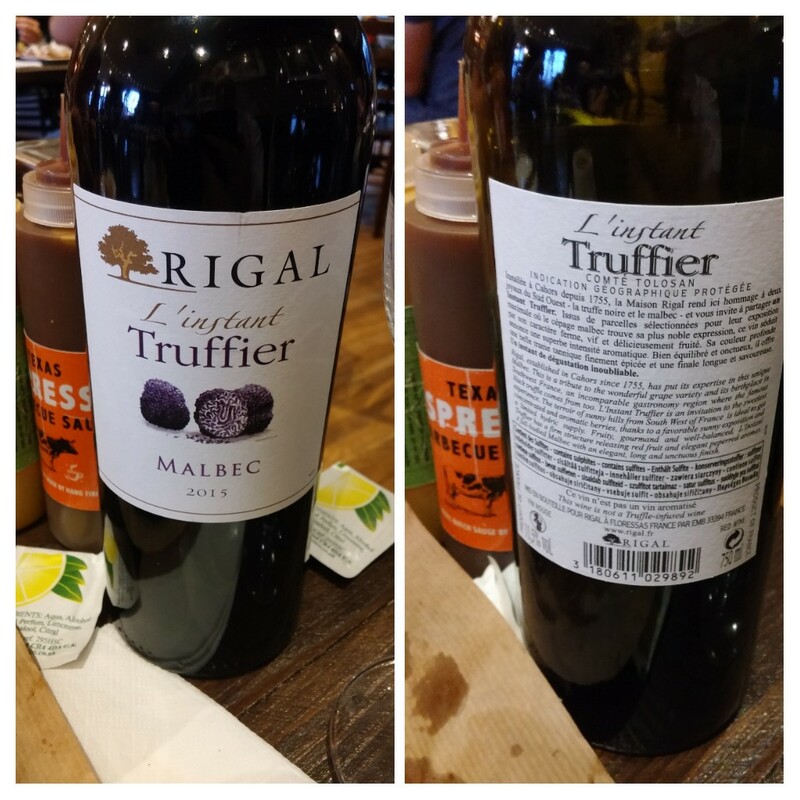 This entry was posted on Sep 25, 2016 by solicitingflavours in Australian wine, Barry, BBQ, Beer, Bierzo, Burger, burgers, craft beer, curing, Drink, Dry rub, Food, Food and wine products, France, French wine, Fried chicken, Hangfire, Hangfire Southern Kitchen, Hot smoking, low alcohol wine, lunch, lunchtime, Mencia, Pork, Red Wine, Restaurant Review, review, Ribs, Sandwich, sausages, Shiraz, Spain, Spanish wine, steak, Sunday lunch, Tempranillo, waffles, Wales, wine pairings.